Anglers across the country are gearing up for the start of a spring fishing season that will likely be different than past seasons – at least where gear is involved. ALL RUBBER IS NOT CREATED EQUAL: Manufacturers have been making rubber-soled boots for years, but recent advancements in rubber-making technology have produced new rubber compounds designed for maximum grip in aquatic environments. Simms was the first fly-fishing manufacturer to partner with Vibram® to produce a rubber compound that provides ultimate traction. PICK A PATTERN: The lug pattern on the sole of a rubber boot can greatly affect how much traction a boot affords an angler. Look for aggressive tread patterns that provide grip in multiple directions. STUD AND CLEAT OPTIONS: Felt soles provided maximum grip when they were studded. The same holds true for rubber boots. 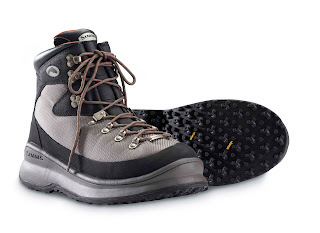 Many of today’s rubber-soled boots are equipped to handle screw-in studs and cleats. Simms offers HardBite™ Studs and Star Cleats, as well as molded AlumiBite™ Cleats that are easily inserted into the sole of the boots. WHAT TO DO WITH OLD BOOTS: Some cobblers are equipped to resole old wading boots with new rubber soles. Check this link for a list of cobblers authorized to resole boots with Vibram® soles. Additionally, old boots loaded with a few flowers make for nice centerpieces on tables at Trout Unlimited banquets or in fishing lodges. KEEP IT CLEAN: While felt soles have been implicated in the spread of aquatic nuisance species, simply switching to rubber-soled boots does not make the problem go away. Now, more than ever, anglers are urged to “Inspect, Clean and Dry” all fishing gear – not just wading boots – after each use. Anglers are encouraged to log on to the Clean Angling Coalition’s site for more information, as well as cleaning and drying tips. KNOW THE LAWS: Maryland’s felt ban goes into effect March 21 of this year. Vermont’s felt ban begins April 1. Alaska goes felt-free across the state on January 1, 2012. New Zealand had been felt-free for several years. Other states and provinces are expected to follow. About Simms’ line of StreamTread® footwear.